Apple iPad or Fluffy White Clouds…. I am a self confessed ‘Apple Addict’ and no amount of therapy could cure me! I’ve waited months and months for the release of the Apple iPad and as the UPS van pulled up outside my study window I was like a kid on Christmas morning, the wait was worth it Apple has once again produced a thing of beauty! I had taken the day of to play with the iPad but when the fluffy white clouds started to form outside I knew it was time to pull myself away and get out there with the infrared camera. 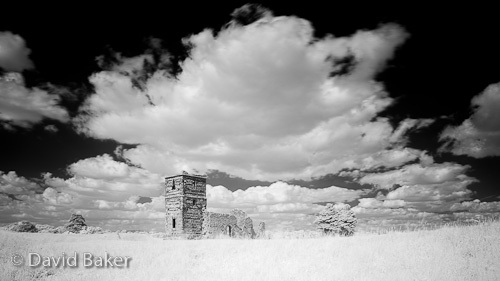 I headed to Knowlton Church a location I had shot before, but had always intended to return armed with my IR camera. The top image is a three image stitch taken with the Canon 24mm TSE lens, shifted to the far left, centre and far right then stitched in Photoshop CS5. The bottom image is a straight shot with the same lens but with the Lee Big Stopper attached……right I’m off for some more iPad playtime. ~ by David Baker on 27 May, 2010.
prefer the pano and those fluffy clouds are amazing.